Now that Sling TV has officially launched, Dish is trying to block the streaming video service on unsupported Android devices. Specifically, Dish is preventing the latest version of its Android phone and tablet app from running on television dongles and set-top boxes. That means you can't sideload the app onto generic Android television boxes or onto Amazon's Fire TV. Update: Amazon announced the availability of Sling TV at its Fire TV app store on February 13. You can get the details here. Dish is working on a proper Sling TV app for Fire TV, along with an app for official Android TV devices such as Google's Nexus Player, but the company hasn't said when those apps will arrive. We've reached out to Dish for clarification on the blocking and the timing of the official apps. Why this matters: While the sideloaded smartphone app works fairly well on a Fire TV, it's hardly ideal to run an older version forever. 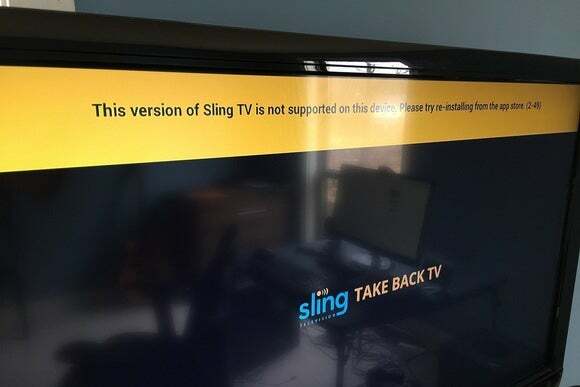 Sling TV's initial release isn't perfect, and users without official device support will have to live without bug fixes and feature improvements. It'd be nice if Dish could let sideloading slide, but as it stands subscribers will have to think twice about buying an Android device without guaranteed support.